Bushnell 134212 12x42mm H2O Binoculars 134212 FREE SHIPPING! 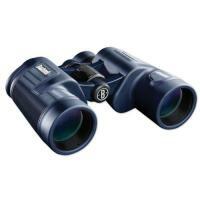 These Bushnell H2O Binoculars were built for an active environment. You know that if you spend enough time outdoors your equipment is going to eventually get wet. Well that's not a problem with the H2O series of binoculars. Covered in slip resistant rubber, these binos are o-ring sealed and are nitrogen purged for reliable, fog-free performance. They also feature BaK-4 prisms for bright, clear and crisp viewing. Multi-coated optics ensure superior light transmission for spectacular view. You will be glad you have these the next time you are outdoors in the wet. ©2002-2019 CopsPlus.com: Bushnell 134212 12x42mm H2O Binoculars 134212 FREE SHIPPING!